Captive Maiden by Melanie Dickerson. Review: Cinderella is a classic fairytale. You know the story, you know how it has a lot of magic; but what you didn't know is that the story is still magical without the magic. It is possible, especially in the story The Captive Maiden the story of Gisela a bright courageous girl living with her stepfamily. The story The Captive Maiden was written by Melanie Dickerson who has an amazing skill for writing. The Captive Maiden is about a young girl Gisela who's father has died leaving her to his evil step-wife Evfemia and her two wicked daughters Irma and Contzel. All her life only the thought of her father, who died when she was little, and the Duke's own son, Valten, kept her happy. Many years later, when running into Fredric Ruexnr, Valten's worst enemy, was when Valten and Gisela met. Valten wanted her to come to the tournament he would be fighting in where he crowns her The Queen of Beauty and Love. This makes Evfemia jealous so she locks Gisela in her room to be bought by none other than Fredric Ruexner. Can Gisela avoid Ruexner and make it to the ball? If so will Ruexner plot revenge on Gisela and Valten? If you want to knowÉ you will have to read The Captive Maiden for yourself. 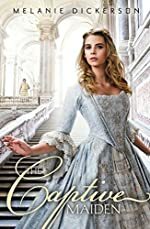 The Captive Maiden is an interesting story with reasons why the reader may or may not enjoy the book. One thing is there is no magic. Personally, someone might enjoy a Cinderella story without magic. Others might think that there is no Cinderella without magic. So this may change your opinion on if you would read The Captive Maiden. Also The Captive Maiden is incredibly descriptive. I felt like I was Gisela, I was distressed when she was locked in her room, I rejoiced when she was crowned The Queen of Beauty and Love. However at some times Melanie Dickerson was over descriptive, The Captive Maiden has a little violence. Some people get broken bones and there is a little blood. Some readers may think the action is thrilling, some however may not read the book because of the violence. I think the part of The Captive Maiden that made it a truly meaningful story was Gisela's positive attitude. All the years Gisela spent with her stepfamily she had two things to keep her happy, Valten and her dad displaying a true passion for Gisela's love - making for an incredible book. I would suggest The Captive Maiden to anyone who thought most of the qualities, such as no magic, and description, make for a fantastic story. We would like to thank Zonderkidz for providing a copy of Captive Maiden for this review. Have you read Captive Maiden? How would you rate it?